LAN Search software is a easy to use and powerful utility for finding specific or certain kind (e.g. all MP3 files) of files. 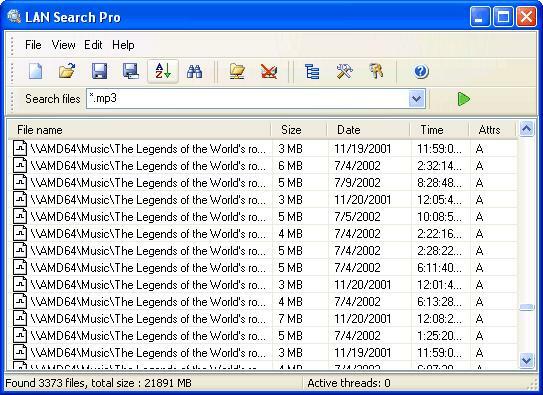 You can search for any kind of file including MP3 with help of Network file search utility. Search software includes the ability to search hidden network resources, restricted access resources, IP subnets etc and provides a lightning fast search engine. ...... subnets and much more. Beside the file searching capabilities, Network file search software provides features that permit you to perform action on the found items � copy, rename, move etc. It comes with a built-in password manager to store your network logins for resources with restricted access. Additional features include result sorting, filtering, export, search within results, minimize to tray and more. Qweas is providing links to Network Files Search Tool 7.0 as a courtesy, and makes no representations regarding Network Files Search Tool or any other applications or any information related thereto. Any questions, complaints or claims regarding this application Network Files Search Tool 7.0 must be directed to the appropriate software vendor. You may click the publisher link of Network Files Search Tool on the top of this page to get more details about the vendor.